However, the waters had not been even in all the years since then. At first, the reconstruction of the war-torn economy took long for the damage inflicted on it during the war years was stern. Then came the challenge of consolidating the economy. It took series of reforms to consolidate the economy into separate but interlinked sectors. As if to rub salt on an injury, putting enough inertia in the sectors to jump start economic growth entailed a huge public investment. All the efforts seem to have brought fruits. Average growth of the last seven years had been close to 11pc, according to official government figures. A significant leap had been realised in education, health and infrastructures development. The nation that once was known to be the poster child of poverty has moved forward to be one of the top five fastest economies of the world. Despite the impressive growth records of the last seven years, the contribution of the private sector in the economy remains marginal. Over 85pc of the gross consumption in the economy originates from the public sector. Private credit as percentage of gross domestic product (GDP), a typical identifier of the role of the private sector in an economy, stands at 18.7pc. Participation of the private sector in the productive sectors continues to be dismal. 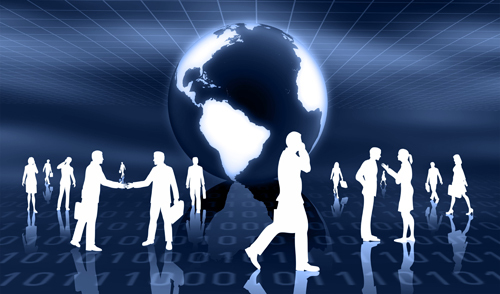 Several factors contribute to the underdevelopment of the private sector, according to experts. A dominant state that limits the role of the private sector to following its shoes stands tall. Regulatory surprises, burdensome bureaucracy and paucity of entrepreneurial clout are also some of the other reasons for the underdevelopment. Measuring the state of the sector and its supporting infrastructure for long had been the World Bank’s Ease of Doing Business Report. Constituting 10 indices that show the whole gamut of factors affecting the development of the private sector, the Report provides a boarder overview of the business environment. Of course, it is not comprehensive. But it is indicative. By ranking 185 countries, the report provides a comparative overview of the business climate of countries. Its latest ranking was no different. One of the indices of the Report is starting business. As shown in the graph the first years of the last decade has seen a significant improvement in the reduction of the cost of starting a business. The cost that once was 483.9 dollars per capita was reduced to 77.4 dollar per capita in 2004. Yet, a sudden rise was witnessed in 2009 to take the cost up to 267.5 dollars per capita. The latest report shows that the cost stands at 135.3 dollars per capita, significantly higher than the sub-Saharan average. The number of days that take to get a construction permit in the country remain flat since the first Doing Business Report was launched in 2003. It takes about 128 days for an investor to get a construction permit in the country. Though construction boom has been the major driver of economic growth in the nation, there seems to be no improvement in the process of getting the permit to undertake one. The latest report has shown that the time stays similar though global and domestic economic realities have changed. It seems to be one of the frontiers that need reform, albeit urgently! The number of days that it takes to get a construction permit directly translates into cost. But such a translation would depend on macroeconomic realities. As could be seen from the graph, the cost of getting a construction permit has declined from its high of 1,695 dollars per capita to 369.1 dollars per capita, in 2012. But, the cost is still high compared to both global and regional averages. In addition to the high cost, the unchanging temporal progress of getting the permit adds a burden on private investors. No doubt that this would make the nation uncompetitive in attracting investors. Bureaucracy is one of the issues often highlighted by private investors as roadblocks to smooth starting and operation of a business. Evidencing this exact situation is the time it takes to register property. 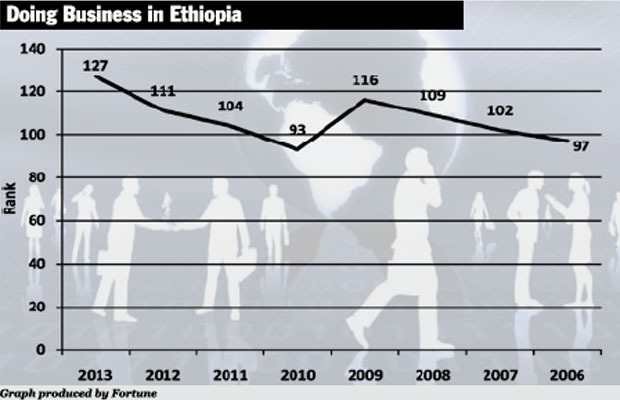 Subsequent Doing Business reports have shown thatEthiopia’s progress in reducing the number of procedures it takes to register a property had only been marginal. The last seven years have shown a reduction of only two procedures with the latest being 10. The progress seems to be at standstill since 2011. It all aligns with what the players on the ground often complain about. The time it takes to register a property has also seen little change in the last seven years. For the 43 days that it had been between 2006 and 2010, it just moved down to 41 days in 2011. The progress remains idle since then. The latest report seems to be an extension of the previous ones in these terms. Measured by any standard, taking 41 days to register a property is dismaying for an investor. Reducing these to even the sub-Saharan average level would require serious policy action. It is a pertinent challenge for the government. 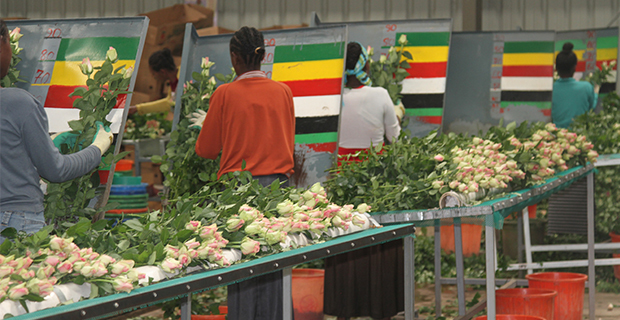 A net importing nation likeEthiopiacould not afford to have a cumbersome import regime. Unfortunately, however,Ethiopialives under such a regime. The time it requires to import a commodity has been rising. A time that had been averaging at 41 days has now jumped up to 44 days. Indeed, the report captures the uproars of the business community over the rather excruciating logistic problem it is forced to shoulder. Such a trend is painful for the nation since import growth, as it relates to increase in production capacity, directly relates to economic growth. The cost incurred by investors to import a commodity also follows the same trend. It remains to be high, at 2,660 dollars per containers, at 2012 prices. At the heart of such a high cost stands the rather monopolised operation of the sector, under the Ethiopian Shipping & Logistic Enterprise (ESLSE). 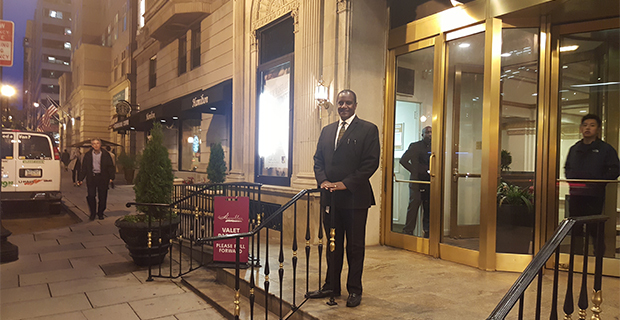 With lack of competition, the private sector stands at the receiving end of the price spectrum. It receives prices, while the ESLSE sets it. The recent shift from unimodal to multimodal transport system worsens the case even further. The private sector is left to live under the wills of the monopoly, albeit wholesomely. Things would have been better had the export regime of the nation that primarily exports primary products was better in terms of competitiveness. But, the agony extends to it with the average time it takes to export a commodity standing at 42 days. The reduction in the index had only been that of 5 days. 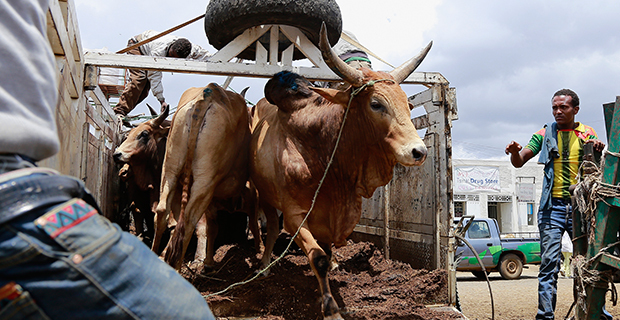 The pick year had been 2010 when the average time it takes to export was 48 days. Even the latest report shows that the regime is a huge roadblock to the competitiveness of the nation. Surely, changing the competitiveness of the nation will require improving the regime. The high cost of importing a commodity seems to be driven by the number of documents that an importer is required to present to varying agencies. Over the last seven years, the number has seen no single improvement. An importer is required to present about nine documents to import a commodity from abroad. Despite the world has moved to a one-window shop service,Ethiopiastill trails back under heavy procedures. No doubt that such a cumbersome system will contribute to the increasing disenfranchisement of the businesspeople. Transforming the system into a more integrated one will be a pertinent assignment for the government. The longer time it takes to export a commodity certainly manifests itself in the end price of commodities. For a nation that competes with limited commodities, mainly of primary agriculture products, the cost will have a downside risk. Worrisomely, however, the average cost of exporting a commodity has increased since 2008. It had moved from the pre-2009 average of 2,017 dollars per container to 2,160 dollars per container after 2009. The latest report also records a similar cost. The voices heard in the business circles of the nation seem to have a valid point for the cost is significantly higher than both global and regional averages. What better frontier of reform could exist than such a wadding export regime, though?